Update 15 december 2011: Het BSS inspiratiehuis 20|20 op Park 20|20 in Hoofddorp is geopend. Park 20|20 is het eerste full service Cradle to Cradle geïnspireerde kantorenpark in Nederland. 4 mei 2010: In Hoofddorp is de eerste steen gelegd voor de bouw van het cradle-to-cradle bedrijventerrein Park 20|20 in Hoofddorp. 23 juli 2009: Zo, het eerste Nederlandse Cradle to Cradle kantoorpand van Nederland is al verhuurd, voor het wordt opgeleverd. BSH Huishoudapparaten zal naar verwachting in het vierde kwartaal 2011 het pand dat gevestigd zal worden in het gloednieuwe kantorenpark Park 20|20 in Hoofddorp in gebruik nemen. Vijf topmerken op het gebied van huishoudelijke apparatuur, Bosch, Siemens, Gaggenau, Neff en Solitaire, samengebracht onder BSH Huishoudapparaten zullen het pand van architect William McDonough, bedenker van het cradle to cradle (C2C) principe. Het kantoorpand onderscheidt zich nadrukkelijk van bestaande bouw en is uniek in Nederland. Cradle to cradle geeft de gedachte weer dat alle gebruikte materialen hergebruikt kunnen worden of teruggegeven aan de natuur. Zo ontstaat een oneindige kringloop; “Afval is voedsel” stelt grondlegger William Mc Donough. Samen met projectontwikkelaar Delta Development Group, Volker Wessels en Reggeborgh Group, is hij nauw betrokken bij Park 20/20. Park 20|20, the first full service Cradle to Cradle inspired business park in Hoofddorp, The Netherlands, is becoming a reality. The first building is due for completion in November of this year. What was necessary to start the dream and then make this dream come true? Answers to that will be given in a workshop at the Cradle to Cradle Festival. 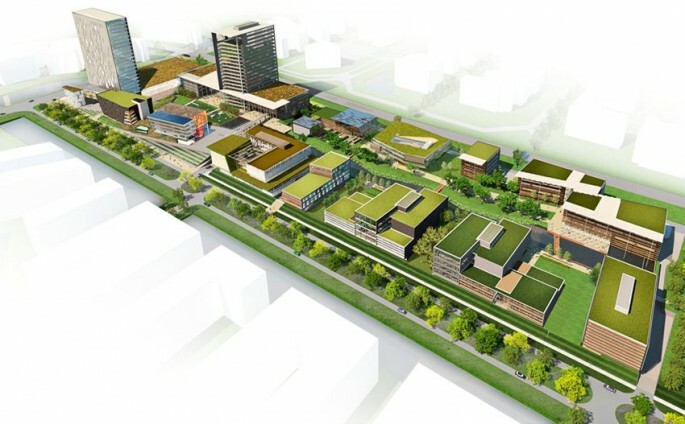 The architecture firm William McDonough + Partners and the landscape architecture firm Nelson Byrd Woltz are creating the first full service Cradle to Cradle development in The Netherlands for the Delta Development Group. The goal is to create an inspirational environment that stimulates the creativity and effectiveness of employees by creating safe and healthy places for work and recreation. Responding to its unique cultural, environmental and contextual challenges, the Park 20|20 master plan creates a mixed-use development that synthesizes the issues of access and mobility, connectivity, passive design, and integrated energy, water and waste management systems. Green zones, urban plazas, public gardens and canal boardwalks within the 114,000 square meters of Park 20|20 encourage a connection to the larger community. Each building’s size and massing is optimized for solar orientation. International pay-TV company Irdeto, are excited by plans to move office sites while remaining within Hoofddorp, part of the Amsterdam Metropolitan Area. The office will be the headquarters for the western world while an office in Beijing, China, is headquarters for Asia. The new office in Hoofddorp is an example of Irdeto’s new methodology of working – eco-friendly while adding economic value, with high quality IT solutions to reduce the need for travel and saving energy. In addition, the office has state-of-the-art technology that helps keep the energy consumption for heating the building to a minimum. Thought to the environment was paramount when designing the building that includes 100 percent sustainable wood while the carpet and wall decoration consists of recycled materials. Situated opposite the railway station and with plenty of bike racks available to employees, providing access to sustainable travel has also been a priority.